Superstar-turning-politician Rajinikanth is facing trouble in both real life and reel life. Till recently he was just a cine superstar, but after declaring his intentions to enter politics with his own political party, his every utterance is being carefully scrutinised by his well-wishers and adversaries alike. Everything about the superstar is special and the devotion of his fans is legendary. In the film-crazed state where fans take hero worship to another level, emotions run high and Rajinikanth’s name spells success in anything he does – on screen. Hoping it would translate into real life, the Southern actor finally took the plunge and began making political moves, and statements. In the Cauvery river water war between Tamil Nadu and neighbouring Karnataka, where he was raised and educated, Rajinikanth was nowhere to be seen. When critics began questioning and more important, his contemporary and competitor on screen and in politics too, Kamal Haasan too spoke up on Cauvery, Rajinikanth was forced to. Since he is playing his political role in real life in Tamil Nadu, Rajinikanth favoured the early setting up of the Cauvery Management Board, a demand that Tamil Nadu has been making for the past several years. Without much success. Although it may have silenced few critics in Tamil Nadu, Rajinikanth found the same comments hurting him in real life – with Kannada groups protesting against his film Kaala to mark their anger over the star for speaking in favour of Tamil Nadu (and by implication being anti-Karnataka). Even Karnataka Film Chamber of Commerce announced it will not allow screening of the latest Rajinikanth film Kaala in Karnataka, as it was standing firm with Kannadigas on the highly emotional issue of Cauvery waters – the lifeline of farming community in Karnataka and the Cauvery delta region of Tamil Nadu. Karnataka may miss the release of Kaala, scheduled for a global release on June 7, as the chamber did not relent. No amount of pleadings of Rajinikanth could make the chamber alter its stance on a day when pro-Kannada activists held protests in Bangalore and other places, seeking a “ban” on Kaala release. The chamber is clearly not happy with Rajinikanth’s appeal to Centre to constitute a Cauvery Water Management Board as directed by the Supreme Court. "His statements on the Cauvery are simply not acceptable. We won't allow the movie even if he apologises," Film chamber president Sa Ra Govindu said. Incidentally, several pro-Kannada outfits requested the chamber to step in and stop Kaala’s release in Karnataka. Activists and farmers in Karnataka believe the state would lose water to Tamil Nadu once the board is formed. If the film does not release in Karnataka, the producers could end up with a Rs 10 crore loss in terms of business. If Rajinikanth’s utterances brought him trouble in Karnataka, his outburst against Sterlite protesters in Tuticorin has brought several political parties baying for his blood. 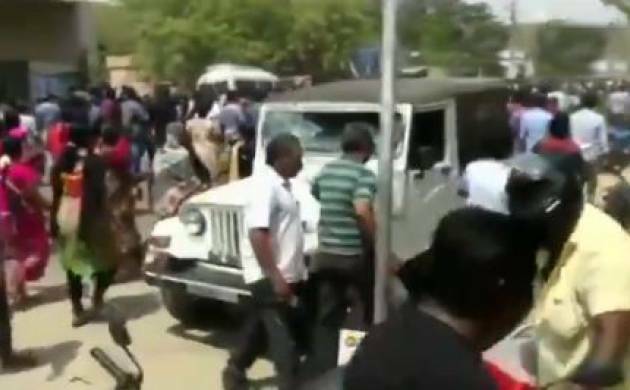 Rajinikanth had justified police firing in which 13 people were killed, saying the mobs were unruly violent and attacking police and public property. Moreover, he dubbed the protesters as anti-social elements and miscreants who were attacking police and destroying property. This has not gone down well with the protesters who were sitting on a peaceful protest for 100 days in Tuticorin demanding the closure of Sterlite Copper Smelter Plant. The main complaint of the protesters was that the plant was releasing dangerous chemicals into the area and causing severe health problems. It has been noticed that people from the region have high incidence of cancer. Barring the BJP and ruling AIADMK, every other political party pounced on the superstar for his insensitive comments and accused him of parroting the BJP line. DMK working president MK Stalin said it appeared that Rajinikanth was speaking the language of the BJP and on its behalf. The public perception in Tamil Nadu is that the BJP is backseat driving the Tamil Nadu government. Defending the superstar, Union minister Pon Radhakrishnan said that there was nothing wrong in what Rajinikanth said about protesters. “I have been saying for the past one and half years that Tamil Nadu was becoming a den of anti-social elements,” Radhakrishnan said. Tamil Nadu Chief Minister Edapaddi Palaniswami too justified police action and concurred with Rajinikanth stand, sparking off speculations if the AIADMK would enter into an alliance with the BJP. With film superstar on their side, the BJP could have a potent combination to win most of the 39 seats the state has to offer in the 2019 general elections.